The holiday season is in full swing. Thanksgiving has come and gone and it’s only a little over two weeks until Christmas Day. Are you prepared? I am not, but I’m getting there. I’ll be picking up my 2016 calendars tomorrow and baking Christmas cookies this weekend. I don’t have any decorations out yet and nothing else done in way of preparation. Then I look at this picture of Dipper a few years ago. He LOVED opening presents. 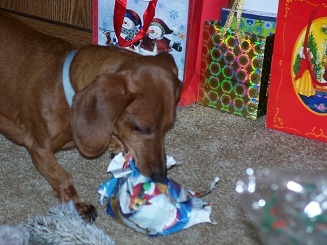 He was always sharing his excitement for his new toys…and opening them like everyone else! He needed no preparation. He had anticipation, excitement and enjoyment. Isn’t that a big part of the season? Christians around the world anticipate the celebration of the birth of Jesus as Dec. 25th nears. They prepare for celebration with decorations, baking and presents. But for some, it’s a sad time, a time of missing loved ones who have gone Home. The earthly celebration seems hollow. Can you imagine if we focused more on preparing our hearts to share Love? Or if we KNEW our lost loved ones were still connected to us at another level unseen? Can you imagine feeling the love you thought lost? This takes a special kind of preparation, one that yields so much more excitement and joy than material possessions can. Are you prepared? This entry was posted in Love, Peace, Spiritual Living and tagged Faith, Peace, Spiritual living. Bookmark the permalink.